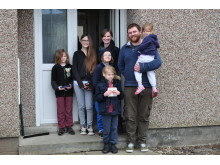 Moray familymove in having been one of the first to apply for, be offered and accept a council property online. 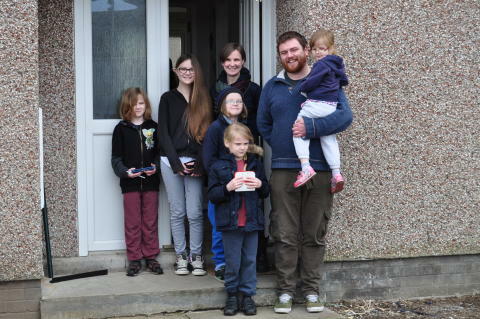 THE Couper family is celebrating after receiving the keys to their new home - becoming one of the first families in Moray to apply for, be offered and accept a council property online. The council’s ‘Moray Connected’ project puts people in control of managing their services on a 24/7 basis, from any online device. 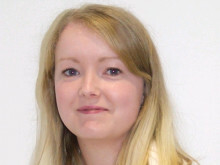 Earlier this year the project team launched a new service which allows Housing staff to send property offers directly to applicants online, rather than relying on the postal service. An applicant can then accept or reject the property online, subject to viewing. For Alan and Claire, this meant that once they had put in their application for a home, they were emailed an offer by the Housing and Property team which allowed them to view their potential new house location on a map and accept it – with just a couple of clicks. 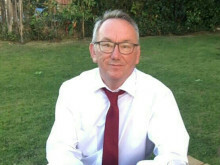 Alan said: “I wasn’t expecting to be able to do it all online, and for it to be so simple. Head of Housing and Property, Richard Anderson, said: “I’m delighted the Couper family have had such a positive experience with our new service. It’s delivering exactly what it set out to do – to allow people like Alan and Claire more flexibility with their services, saving them the time and hassle of responding to letters or having to visit us in an Access Point or calling our Contact Centre. “There are benefits for us too - cost savings from sending out letters by post, and time savings through almost instantaneous responses means we can get applicants into their new homes sooner. Moray Council has launched a survey to better understand how people use its website and what they can do to make it work better for customers.